Update: the Taxi Driver Protection Act passed the full New York City Council Wednesday afternoon. The bill now goes to the Mayor to sign within 30 days, then TLC rulemaking for the implementation. 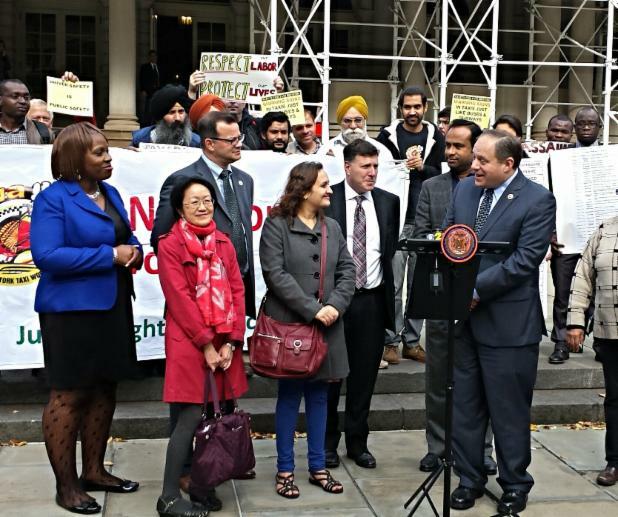 Members of the New York Taxi Workers’ Alliance rallied on the steps of City Hall Tuesday afternoon in a final push for passage of the Taxi Driver Protection Act, calling for warning signs in yellow taxis, green cabs, liveries and black cars, before a full Council vote on Wednesday. “Assaulting a Taxi or Livery Driver Is Punishable By Up to 25 Years in Prison,” the signs would read. State law already calls for a penalty enhancement of five (5) additional years to the maximum penalty when the victim of felony assault and other crimes is a taxi or FHV driver. The passage of the Taxi Driver Protection Act will ensure that there is education so the law can serve as a real deterrent for would-­be assailants and a reminder to police and prosecutors to take assaults and crimes against taxi and FHV drivers more seriously. The latest Department of Labor study cites that taxi drivers are 30 times more likely to be killed on the job than other workers. Just this year, there have been a high number of violent assaults and shootings of taxi and livery drivers. “There is an urgency for the city to show that it stands with the drivers and will protect them,” said NYTWA Executive Director Bhairavi Desai. If the Council passes the bill, New York would join Pennsylvania, Illinois and California which already require similar warning signs. NYC yellow taxi, green cab, livery and black car drivers serve half a million New Yorkers and tourists every day. Once passed by the full Council and signed by the Mayor, the Taxi and Limousine Commission will enact rules making the warning sign a requirement. At the City Hall rally, drivers were be joined by bill sponsor, Councilman Rory Lancman, and stood with fellow drivers like Mr. Haq who have overcome traumatic assaults to fight for the protection of all drivers.